It’s been scorching in Sydney and all across Australia as the heat surges to its 40s. Adelaide was just declared the hottest city in the planet last week as temperatures soared to 46.5* and the tennis players at the Australian Open can’t escape from what is summer in Australia. I’m not complaining though. I love summer and everything that goes with it – Australian flies and all. It's summer and stone fruits are a plenty! Sometimes I get overly excited at my local fruit and veg shop and just buy buckets load. Sadly, with the heat most fruits soften quickly than normal at room temperature. So some of these were put to great use - home made fruit pops or popsicles. They're healthy, all natural and great to combat sweet cravings in the summer heat. 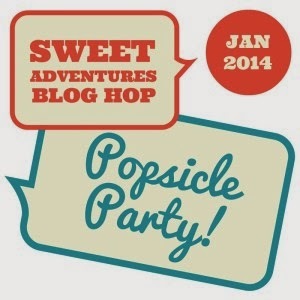 And a big thanks to Swah for hosting this month's Sweet Adventures Blog Hop! Check out her elegant white tea, pomegranate and mint popsicles! To make these popsicles, we used plastic cups and wooden disposable forks. Using a blender, mix/process the fruits then add the orange juice slowly. Add the water as much or as little as you want. We used all 2 cups. Pour into small plastic cups. Then place in the freezer for 30 minutes. When the popsicles are slightly firm, place wooden disposable popsicle sticks or wooden disposable forks. Freezer overnight or for at least 6 hours. These popsicles definitely brought out the party mood in our home. Yum! What a refreshing sounding combination! I love stone fruits too, actually I love all summer fruits! Yes, we love all summer fruits here too! And popsicles are such an easy way to make use of them! Thanks for your kind words. These look the perfect, healthy summer treat! I remember in primary school we used to have "pineapple pops" I think they cost around 20c and were just pineapple juice frozen in cups with paddle pop sticks.... I loved them! Growing up, we had orange pops which was exactly the same. These days, they're so easy to make we don't need to buy them anymore. Just a little bt of patience is all we need. Thanks for hosting this month's SABH theme! I think pineapples are going to be great to make next time especially they're in season at the moment. Peaches and strawberries - what a perfect summer combo! Great idea to use cups, thanks for joining! Thanks JJ. They're so refreshing and perfect indeed! Thanks for this fun theme this month!